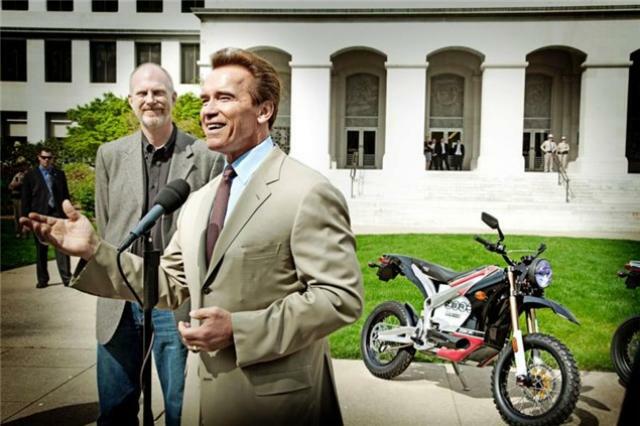 ELECTRIC BIKE manufacturer Zero Motorcycles gave Hollywood legend-turned-California Governor, Arnold Schwarzenegger a personal demonstration of the company's products earlier this week. 'Arnie', an avid motorcycle enthusiast, best known for his role as the Harley-riding robot in the Terminator films, received the demo of Zero's all-new 2010 product line from Zero Motorcycles' CEO, Gene Banman. California State Government recently approved an all-new statewide rebate program, providing consumers with up to $2500 (£1680) saving on the purchase of a Zero electric motorcycle, when combined a Federal Tax Credit. "Zero electric motorcycles are very important technology and this is great for California because this is an ideal place to ride motorcycles," said Governor Schwarzenegger. "I want to personally thank Gene Banman and Neal Saiki for bringing these innovative electric zero emission motorcycles to the capitol for us to see. I love the financial side of these motorcycles because they cost less then one cent per mile to operate and you get a 10% federal tax credit plus a California rebate of $1,500. That equates to a 25 percent price reduction making these electric motorcycles affordable for anybody, and Zero Motorcycles has developed the type of technology that will save us all by reducing greenhouse gasses while utilizing renewable energy." "We are honored to be here and to have received the support of Governor Schwarzenegger. We are a California company creating California jobs and are extremely proud the Governor's office recognized us for our efforts," said Gene Banman, CEO, Zero Motorcycles. "Our motorcycles are truly game changing and once you ride one, you immediately realize that electric motorcycles are here to stay. Our motorcycles are high performance, fun to ride and the best part is, you can buy one today." What? A lightweight electric bike?